I often drag the close modal out of the way to check something in the question or a comment, and noticed recently that sometimes I'm dragging it so the top of the modal is under the nav bar. Indeed, I can drag it well out of the browser's viewport – I noticed this recently in regards to the new top bar, but I'm not sure if it was always possible to drag off screen. Dragging offscreen is not a problem in itself, but when the draggable area is offscreen, I'm no longer able to drag the box back! The dragging of the close/flag modal's top bar should be limited to the viewport, and z-index should also be increased so the modal is always above the top-nav bar. 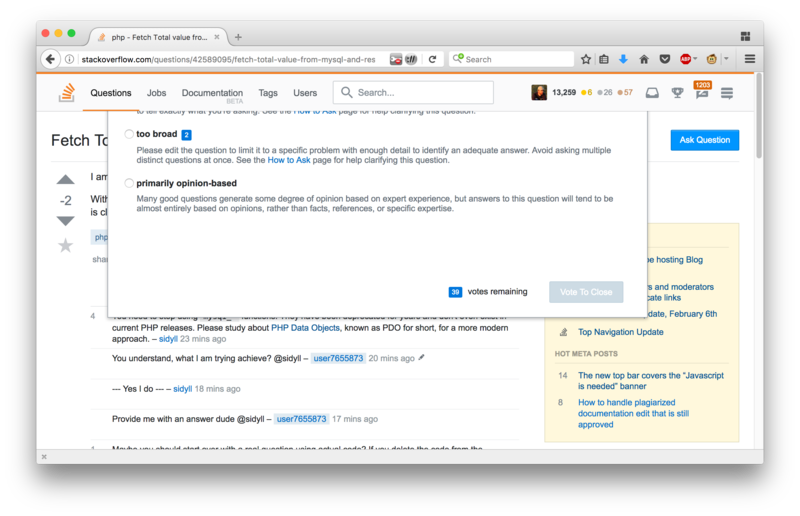 Browse other questions tagged bug design top-bar close-dialog .